North Vancouver residence generating solar power – in fact they are Net Zero over the year! Vancouver Renewable Energy supplies and installs all of the equipment for both off-grid and grid-tie solar power systems in Surrey and White Rock regions. We have solar photovoltaic installations in municipalities all over the Metro Vancouver. In fact, we installed the first grid-tied photovoltaic systems in the districts of Vancouver, North Vancouver, Langley, and Mission. Our extensive experience with BC Hydro’s Net Metering Program will make your grid connection a simple and painless experience. BC Hydro’s Net Metering Program allows BC Hydro customers to connect their Surrey-White Rock solar power systems directly to the grid. This allows customers to efficiently offsets their electricity consumption and even allows for credit should you produce more than you consume. 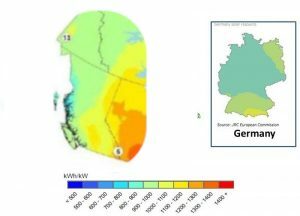 Before you buy or install a photovoltaic system, we recommend having an assessment to estimate the solar energy potential at your site. Please visit our assessments page to see the different types of assessments or Contact Us if you would like further information. Not only will a solar power system provide you with decades of green energy, it is a robost and excellent way to add home equity. Solar power systems are an attractive selling feature should you ever decide to sell you house and should significantly increase its value. Invest in home equity while reducing your electricty bills, solar power is a great option! How much does PV cost? Small portable systems start at about $2,000 We have designed and installed residential systems ranging from $7,000 – $45,000. Systems for commercial buildings can range from $10,000 to $200,000. These prices include all equipment, installation work, electrical permits and utility paperwork. The range in price is primarily affected by the system size. If you know what size system you are looking for we can provide a quote. If you provide an address we can use aerial photography to produce a remote estimate. If you want more information about the energy potential of your site we also offer the service of performing an assessment. The assessment report presents system performance and finanacial analysis for the potential project. Assessments prices start at $250. The assessment cost would be credited against the cost of installing your system if you choose VREC as your supplier and installer. Can I buy just the panels? Yes, we sell the individual sub-system parts. Photovoltaic panels have been constantly decreasing in price so please Contact Us to ask about updated pricing or for more detailed information. And, as always, we offer our experienced installation crew to ensure your panels achieve maximum efficiency! How will it work for my building? Ideally the building should have a roof surface that allows panels to be mounted facing south with little or no shading. We recommend booking an assessment with VREC. This consultation will provide you with a report on your building’s suitability for solar and what the costs and output will be for your specific conditions. Cost of this assessment is credited against your purchase of a system and installation from us. Is there enough sun here? 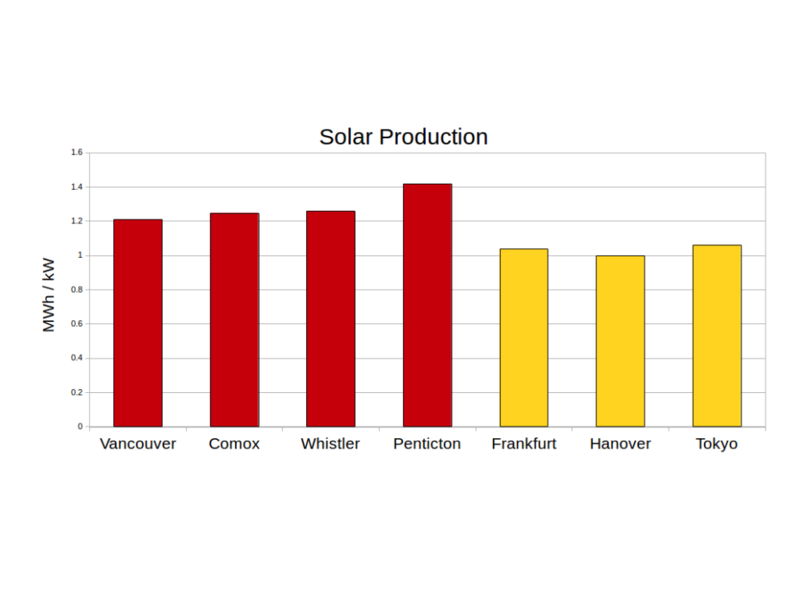 Yes, there is enough sun in rainy Metro Vancouver to generate electricity. The nation that generates the largest percentage of its electricity from photovoltaics is Germany and most of that country receives less annual sunlight than Vancouver. In fact solar energy provides 100% of the electricity needed for this small, energy conserving household in North Vancouver. Will PV pay for itself? 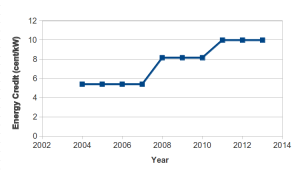 BC has some of the lowest priced electricity in the world. So, over the short term the financial payback of PV on grid-connected buildings does not look good. However, if you evaluate the financials over the lifetime of the system it will have a positive net return on investment. Currently, a PV system is more like a hybrid vehicle; it does save some money, but is generally installed more for environmental or energy security benefits. It is definitely more cost-effective for off-grid buildings. Can I see a PV system that you have installed? You can see and inspect one of our installations at the Society Promoting Environmental Conservation, and we will happily give you a tour of their system. This is the first grid-tied PV system in Vancouver, designed and installed by VREC. See our portfolio for more pictures of installations. Can I sell excess power to BC Hydro? Are there any grants or incentives? Since 2004 BC Hydro has allowed renewable energy systems to connect directly to the grid, allowing you to “sell” surplus power to the grid. The BC Hydro program is called Net-Metering. 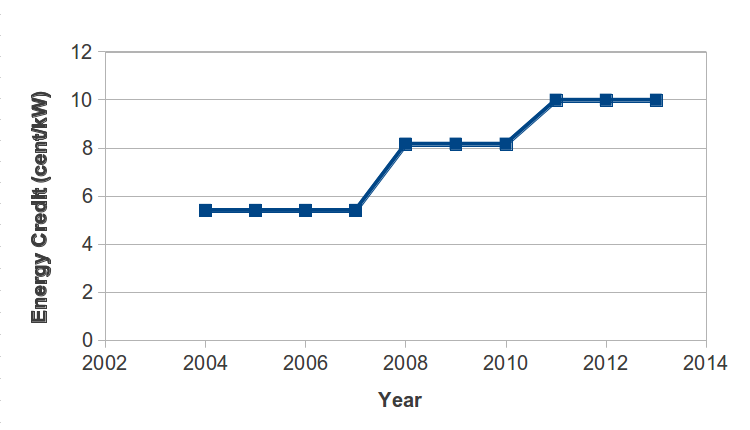 The historical energy credit for annual excess power that BC Hydro has offered is shown below. VREC has installed the first such systems in Vancouver and North Vancouver. We also have experience arranging for permits and grid interconnection in municipalities that are unfamiliar with photovoltaics. The BC LiveSmart grant for photovoltaic systems ended in 2014. Can I be completely independent in case the power goes out? If you want to be completely off-grid or to have fuel and noise free backup power in an emergency, you can add a battery bank to store the power on-site for later use. VREC can also custom design back-up systems, for example a generator/PV hybrid, where a gas generator will automatically turn on when the power from solar charged batteries is gone. How do I get started on making my home solar electric? Call VREC at 778-918-3973 to schedule an assessment of your building. An assessment includes a quote, shade analysis and report. Cost for this consulting service is currently starts at $200 for a residential photovoltaic system. 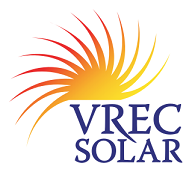 This cost is credited against the price of a system purchased from and installed by VREC. Please contact us if you have any questions or would like further information. What do VREC clients think of their systems? * Featured on the cover of Home Power magazine summer 2007.